Fabric: 100% Polyester. Soft, stretchy and breathable. 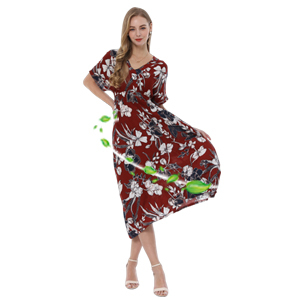 This is a great beach dress for Barto party time. Features: Short sleeves, deep v-neck, full length, elastic waist for slim fit. Pattern: Multiple different prints of tropical style, provide you the most charming look when you walking on the beach. Occasion: Travel, beach party, poolside, beach, holiday. Washing Suggestion: Machine wash cold and hang dry. Wantdo maxi dresses strikes the balance between fashion and elegant, designed for women who want an everyday dress that sizzles. 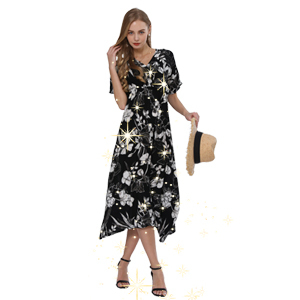 Whether you’re looking for a fit and flare dress for your next party or a maxi dress for a casual weekend, the collection includes contemporary designs and colors that work regardless of shape and body type, you'll be dressed for the occasion.